This beloved TV series first aired July 5th, 1989 and the last episode was on May 14th, 1998. The show ran for 9 seasons and is now in syndication. 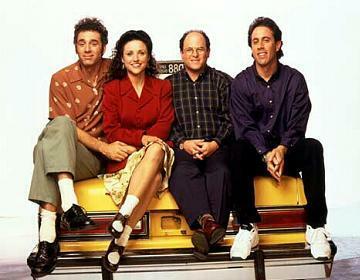 Seinfeld takes place mainly on an apartment block in Manhattan's Upper West Side. The characters on the show consist of Jerry Seinfeld as a fictionalized version of himself and an array of his friends and acquaintances. Jason Alexander plays the role of Jerry's best friend George Costanza. Julia Louis-Dreyfus plays his former girlfriend Elaine Benes, and the neighbor across the hall, Cosmo Kramer, is played by Michael Richards. The plotlines consist of the gang discussing quirky events that happen in every day life to which those living in New York City can relate. Larry David and Jerry Seinfeld created Seinfeld. Over sixteen scriptwriters contributed to the production. Friends first aired on September 22, 1994. It lasted 10 seasons and the finale took place on May 6, 2004. Filming of the show was located at the Warner Brothers Studio in Burbank, California. The show is about six friends living in Manhattan who find comfort in one another while working through the struggles of every day life. Rachel Green (Jennifer Aniston) is a fashion enthusiast and Monica Geller's best friend from childhood. The character Monica Geller is played by Courtney Cox and is known as the mother hen of the group. Phoebe Buffay (Lisa Kudrow) is an eccentric masseuse and self-taught musician. Joey Tribbiani (Matt LeBlanc) is a struggling actor and Chandler Bing (Matthew Perry) is a corporate executive. Ross Geller is Monica's older brother and is played by David Schwimmer. Over 51.1 million viewers made Friends the 4th most watched season finale in TV history. The Cosby Show aired for eight seasons from September 20th, 1984 to April 30, 1992. It is about the Huxtables who are an upper middle class African American family living in Brooklyn, NY. Heathcliff Huxtable (Bill Cosby) is an obstetrician and his wife Claire (Phylicia Rashad) is a successful attorney. They are a happily married couple with five children and as the show progresses the family continues to grow. The Cosby Show was the "biggest TV hit of the 1980s" according to TV Guide. James L. Brooks and Allen Burns created this popular television series. Mary Richards (Mary Tyler Moore) is the main character, and at age thirty she moves to Minneapolis, Minnesota after breaking off an engagement with her boyfriend of two years. She ends up getting work at a small TV station as an assistant producer for the six o'clock news. She is surrounded by characters Lou Grant (Ed Asner), her grumpy boss, the news writer Murray Slaughter (Gavin MacLeod) and the anchorman Ted Baxter (Ted Knight). Later on in the TV series, Mary becomes the producer of the show. The Mary Tyler Moore show was filmed at the CBS studios in Los Angeles, CA. It aired on CBS from 1970 to 1977. This hit show is based on the BBC series the Office. It aired for 9 seasons on NBC from March 24, 2005 to May 16th, 2013. Starring Steve Carell as Michael Scott, The Office also features: Rainn Wilson, John Krasinski, Jenna Fischer, B.J. Novak, Ed Helms and Melora Hardin. The show takes place in Scranton, Pennsylvania where a branch of the fictional paper company Dunder Mifflin is located. It is a "mockumentary" and depicts the daily life of office workers. To simulate the look of a documentary the show was filmed using a single camera setup without a studio audience or a laugh track. The Office was adapted for American writers by Greg Daniel and had over 10 different producers. The Simpsons is an American animated sitcom created by Matt Groening. It is a satirical parody of the American middle-class lifestyle. It first aired on December 17th, 1989 and ended after twenty-four seasons on May 19, 2013. The Simpson Family is comprised of Homer, Marge, Bart, Lisa and Maggie. The show takes place in the fictional town of Springfield. The Simpsons is often called the greatest television show of all time. It was the longest-running sitcom and American animation program. The Simpsons movie was released in July 2007 and grossed over $500 million. The Simpson family was awarded a star on the Hollywood Walk of Fame. I Love Lucy is a black and white sitcom that aired from October 15th, 1951 to May 6th, 1957. It was first shot on 35 mm film in front of a studio audience. The show takes place in a New York City apartment building starring Lucille Ball as Lucy Ricardo and her singer/bandleader husband Ricky Ricardo (Desi Arnaz). Their best friends Ethel Mertz (Vivian Vance) and Fred Mertz (William Frawley) co-star. Ricky is an up and coming musician and Lucille is an aspiring performer/singer. The show revolves around Lucille's antics and trouble that she gets herself and loved ones into. Chuck Lorre and Bill Prady created The Big Bang Theory. The show first premiered in 2007 and is still running. It takes place in Pasadena, California. The main characters include Leonard Hofstadter (Johny Galecki) who is an experimental physicist with an IQ of 173. His roommate Sheldon Cooper (Jim Parsons) is a theoretical physicist researching quantum mechanics and string theory. Penny (Kaley Cuoco) is their neighbor who lives across the hall. She is an aspiring actress who works at the Cheesecake Factory. The geekiness of Leonard and Sheldon in contrast to Penny's street smarts and social skills create an entertaining comedic effect. Other characters include: Howard Wolowitz (Simon Helberg), Raj Koothrappali (Kunal Nayyar), Bernadette Rostenkowski (Melissa Rauch), and Amy Farrah Fowler (Mayim Bialik). William Bickley and Michael Warren created this popular American sitcom that ran for 9 seasons from September 1989 to September 1997 on the ABC network. It was about a middle class African American family, The Wilsons, and their pesky neighbor Steve Urkel played by Jaleel White. Family Matters takes place in Chicago, IL and is a spin off the earlier sitcom: Perfect Strangers. Tina Fey created this hit sitcom that aired from October 2006 to January 2013. The show is inspired by Tina Fey's experience working as head writer for Saturday Night Live. 30 Rock takes place behind the scenes of a fictional live sketch comedy series called "TGS with Tracy Jordan." Liz Lemon (Tina Fey) is the head writer of the series and the supporting cast includes Alec Baldwin, Tracy Morgan, Jane Krakowski and Jack McBrayer. The show takes place in New York City at 30 Rockefeller Center where NBC studios' headquarters are located.